Whether it's pint glasses, shot glasses, coffee mugs, wine glasses, wine bottles - well, you get the idea - lasers work wonderfully for customizing all kinds of glass products! Glass engraving and etching with a CO2 laser produces a beautiful frosted effect, allowing you to etch custom logos and designs on nearly any glass product. Epilog's Rotary Attachment option makes setting up glassware for engraving a breeze! The rotary allows you to easily set up different sizes of glasses, mugs, vases and wine bottles for engraving. The rotary turns the piece as the laser etches your pattern. No special measurements are required to create these custom etchings! Please send me more information about etching glass with an Epilog Laser system. What can you create with a laser? 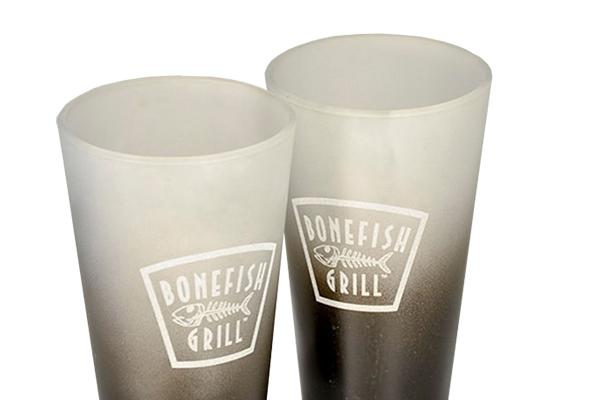 Strengthen your brand by etching your logo, company name, or custom graphics into pint glasses, wine glasses, champagne flutes, coffee mugs, serving dishes, and more. Take your gift from bland to grand by custom-etching glassware with the recipient's name or a graphic to mark the occasion. The possibilities are endless when you use an Epilog Laser for glass engraving projects. Whether you're lauching a new product, branding your own promotional products, or simply engraving a gift for a friend, a laser system can help you create faster and with higher quality. All it takes is a little imagination and an Epilog Laser! "Our Epilog Laser systems have allowed us to separate ourselves from our competition." With step-by-step instructions and free graphics files, get new project ideas every month! How easy is it to use an Epilog laser system? It's as easy as 1-2-3. Since our laser systems work pretty much like a standard printer, they keep your workflow simple. Create a new page in your graphic software. Import or create your own custom design. Send your design to the laser. In the print driver you’ll select the laser parameters you want to use, or select a preset material setting from Epilog’s extensive database. Select your file at the laser, put your engraving material in the machine, shut the door, and press GO. The laser will do the rest! "Another thing I love about my laser is that it has become my go-to machine - whenever I need anything to make my company better, I think of the laser first." - Celeste Wong, Celeste Watch Co. Which machines are best for laser etching glass? Whatever the scope of your glass etching project, Epilog Laser has a machine that will fit your needs, from entry-level systems to top-of-the line machines. The Zing 24 is one of our entry-level machines. For smaller glass etching projects requiring high-quality engraving and cutting with minimal investment, the Epilog Zing series is a great choice. If you're looking to work with larger pieces, the Helix 24 is an ideal choice. With a greater-volume work area, it is great for thicker items and lasering multiple pieces at the same time. Featuring our largest work area at 40" x 32" (1016 x 711 mm), the Fusion M2 40 is our newest, top-of-the-line CO2 laser system. For glass etching requiring the best tool available, the Fusion M2 is the way to go. The Zing 24 is one of our entry-level machines. For smaller projects requiring high-quality engraving and cutting with minimal investment, the Epilog Zing series is a great choice. If you're looking to work with larger pieces, the Helix 24 is an ideal choice. With a greater-volume work area, it is great for thicker materials and lasering multiple pieces at the same time. Featuring our largest work area at 40" x 28" (1016 x 711 mm), the Fusion M2 40 is our newest, top-of-the-line CO2 laser system. For glass etching projects requiring the best tool available, the Fusion is the way to go. Fill out the form below and we'll send you a full product line brochure, as well as engraved and cut samples made with our laser systems. Nothing beats seeing the end product in person.